A tribe is viewed, developmentally or historically, as a social group existing before the development of, or outside, states. A tribe is a group of distinct people, dependent on their land for their livelihood, who are largely self-sufficient, and not integrated into the national society. It is perhaps the term most readily understood and used by the general public. Stephen Corry, director of Survival International, an organisation dedicated to indigenous rights, defines tribal people as those who "...have followed ways of life for many generations that are largely self-sufficient, and are clearly different from the mainstream and dominant society." This definition, however, would not apply in countries in the Middle East such as Iraq, where the entire population is a member of one tribe or another, and tribalism itself is dominant and mainstream. Many people used the term "tribal society" to refer to societies organized largely on the basis of social, especially familial, descent groups (see clan and kinship). A customary tribe in these terms is a face-to-face community, relatively bound by kinship relations, reciprocal exchange, and strong ties to place. "Tribe" is a contested term due to its roots of being defined by outsiders during the period of colonialism. The word has no shared referent, whether in political form, kinship relations or shared culture. Some argue that it conveys a negative connotation of a timeless unchanging past. To avoid these implications, some have chosen to use the terms "ethnic group", or nation instead. In some places, such as India and North America, tribes are polities that have been granted legal recognition and limited autonomy by the national states. 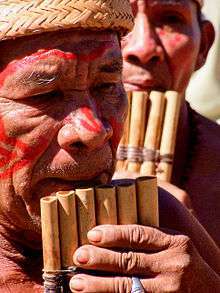 A shaman from a tribe in the Venezuelan Amazon playing a siku. The English word tribe occurs in 12th-century Middle English literature as referring to one of the twelve tribes of Israel. The word is from Old French tribu, in turn from Latin tribus, referring to the original tripartite ethnic division of the Ancient Roman state: Ramnes (Ramnenses), Tities (Titienses), and Luceres, corresponding, according to Marcus Terentius Varro, to the Latins, Sabines, and Etruscans, respectively. The Ramnes were named after Romulus, leader of the Latins, Tities after Titus Tatius, leader of the Sabines, and Luceres after Lucumo, leader of an Etruscan army that had assisted the Latins. According to Livy, the three "tribes" were squadrons of knights, rather than ethnic divisions. The term's ultimate etymology is uncertain, perhaps from the Proto-Indo-European roots tri- ("three") and bhew ("to be"). Gregory Nagy, in Greek Mythology and Poetics, says, citing the linguist Émile Benveniste in his Origines de la formation des noms en indo-européen, that the Umbrian "trifu" (tribus) is apparently derived from a combination of *tri- and *bhu-, where the second element is cognate with the 'phu-' of Greek phule, and that this subdivided the Greek polis into three phulai. In 242–240 BC, the Tribal Assembly (comitia tributa) in the Roman Republic included 35 tribes (four "urban tribes" and 31 "rural tribes"). The Latin word as used in the Bible translates as Greek phyle: "race, tribe, clan," and ultimately the Hebrew, meaning or "sceptre". In the historical sense, "tribe", "race" and "clan" can be used interchangeably. 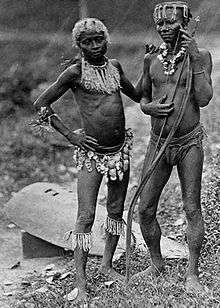 Two men from the Andamanese tribe of the Andaman Islands, India. Considerable debate has accompanied efforts to define and characterize tribes. Scholars perceive differences between pre-state tribes and contemporary tribes; there is also general controversy over cultural evolution and colonialism. In the popular imagination, tribes reflect a way of life that predates, and is more natural than that in modern states. Tribes also privilege primordial social ties, are clearly bounded, homogeneous, parochial, and stable. Tribes are an organization among families (including clans and lineages), which generates a social and ideological basis for solidarity that is in some way more limited than that of an "ethnic group" or of a "nation". Anthropological and ethnohistorical research has challenged all of these notions. 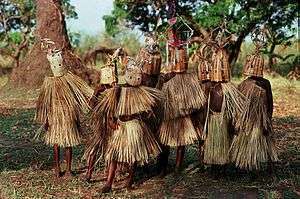 Initiation rituals among boys from a tribe in Malawi. 1 2 "What is in the word tribe?". Pambazuka. 22 January 2008. Retrieved 4 October 2012. 1 2 "IC Publications | Opinions". Africasia. Retrieved 4 October 2012. 1 2 "Talking about "Tribe"". Africa Action. Retrieved 2012-10-04. Korotayev, "Chiefdom: Precursor of the Tribe?"